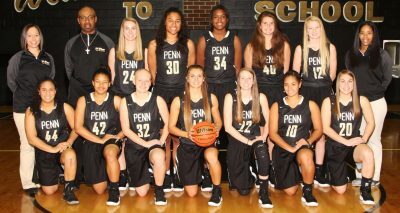 After fighting a close game through three quarters, the Penn Girls Basketball Team took control in the fourth quarter to outscore Warsaw 22-15 and claim a 51-43 victory against the Tigers. Senior point guard Sara Doi led Penn with 19 points. Freshman Jordyn Smith scored 11 points. Next Story → Girls Basketball: Head Coach Kristi Kaniewski Ulrich makes school and program history.